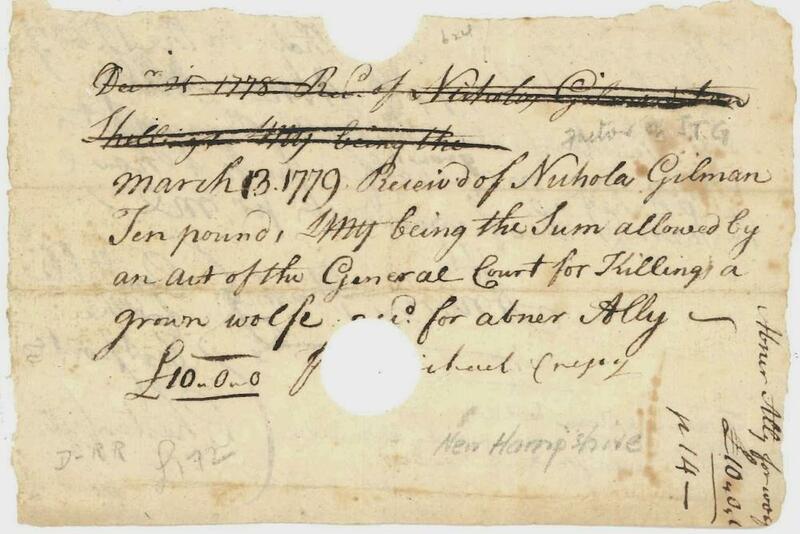 This slip of paper shows how settlers were compensated for killing wolves in New Hampshire during the time of the American Revolution. 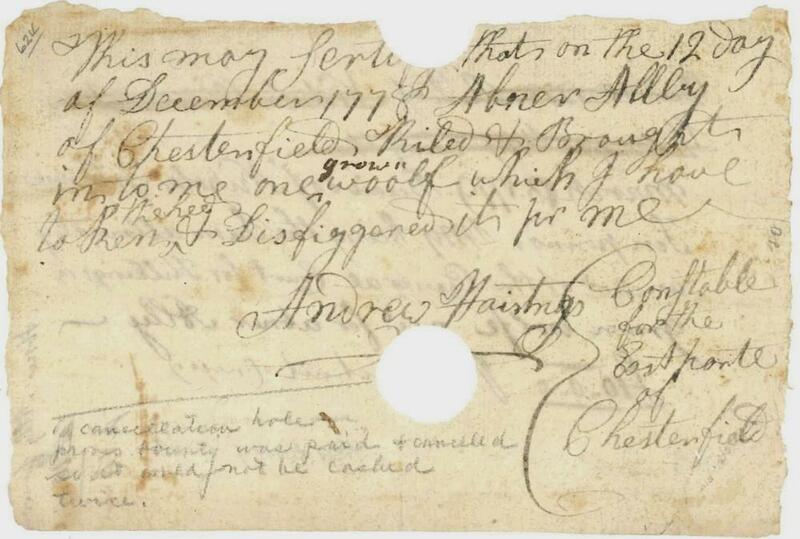 Side 1 is a signed statement from the constable of Abner Ally’s small town of Chesterfield, attesting to his having killed a “grown woolf.” Side 2, dating to several months later, is a receipt for 10 pounds, signed by Nicholas Gilman, then the state treasurer. The blog of Dartmouth’s Rauner Special Collections Library, which holds this document, notes that in 1778 10 pounds was “just a little less than a sergeant in the British Army would have earned in a year.” The richness of the sum reflects the state’s desperation to eliminate the predators, who then ranged across the state. At a time when colonists had far more land than manpower, and often had to leave livestock unattended, the wolves’ depredations seemed particularly threatening. As historian Jon T. Coleman writes in his book Vicious: Wolves and Men in America, colonial New Englanders regarded the animal with such loathing that they often beheaded wolves killed for the bounty, “nail[ing] the canine’s bloody skull to the side of the town’s meetinghouse for the residents to ponder and admire.” The constable may be referring to a similar act when he writes on this receipt that he has “taken the hed” of the wolf that Ally killed. According to the U.S. Fish and Wildlife Service (PDF), wolves were extirpated from the New Hampshire woods by the late 19th century. Rauner Special Collections Library, Dartmouth College.